While digging around in my car, I found this little guy where I’m assuming the original mechanical parking brake used to be. 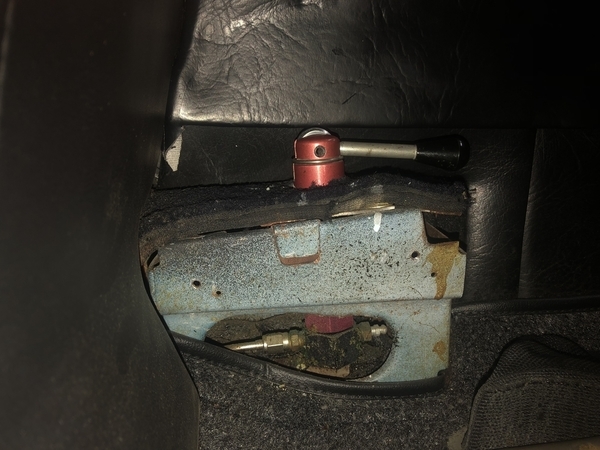 Is this a line lock parking brake that was intended as the substitute for the mechanical lever assembly that was unceremoniously cut out of the car by a previous owner? If this is the case, then perhaps someone can give a guy who’s only experience with parking brakes has been the lever or foot activated kind some advice as to it’s operation? That’s what it is; a hydraulic line lock. It’s just a valve that holds pressure in the rear brake lines when it’s turned “on”. Naturally, you need to step on the brake pedal before turning it on. I’ve heard lots of horror stories about people turning the lever to “on” without holding the brake pedal down first and naturally, the car rolls away! The line lock was designed for fork lifts and that’s where it should stay. If I were you, I’d be thinking about re-installing a non-hydraulic parking brake. There are a number of design and safety choices made with this car that will be going as far away as I can throw them. This will be one of them. Along with a complete set of Wilwood 4 piston brakes and larger rotors, I’ll be installing an electronic push button parking brake. As it is now, when the car has been parked, I’ve done so under the assumption that there was never a parking brake. I park it, leaving it in gear, and I block the wheels for good measure. I’ll start using this thing as an added bit of protection but will still park it in gear and continue using wheel blocks until the push button brake is installed. Additionally, I’d have tried to restore the lever based system but all of the mounting points under the car have been cut off the chassis by a previous owner, probably around the same time that the stainless water lines were installed. You are describing exactly the same situation I found with 2511. I am reasonably sure that this is a modification done for a previous owner while the car was restored at Dennis Quella’s shop. In over 15 years of use I have found the line lock to be sufficient, although not legal in any state that requires annual inspections. Keep in mind, these parking brake calipers were designed by Brembo for a 4,650 lb car. They should work very well in a Pantera application. I’m picking up everything from SACC Restorations here in town. Wilwood brake set for all 4 corners, electronic parking brake, and power steering module. I have no idea why someone would want to do away with the cable operated safety aspect of the hand / emergency brake. On a race car yes, on a 50 year old street car NFW . Chances of a dual front and back failure are slim but once and you're screwed. Think emergency not parking brake. The reason for this is because all of the mounting points on the underside of the car for the manual lever system were simply chopped off at some point in the past. There’s nothing under the car at all to even try to recover. I've had my fair share of those kinds of things on other cars. It's a go figure. I'll tell you exactly why the line-lock was installed. 20 or 30 years ago, there was no readily available parking brake caliper kit to use if you installed larger than stock rear rotors. Unless you were a machinist, you had two choices: either have the bracket modified that mounts the OEM rear caliper, and use it (the OEM caliper) as a parking brake only, or install a hydraulic line-lock. If you used the OEM caliper you were adding a ton of unsprung weight whereas the line-lock added zero. Some people hated the idea of a line-lock but others just couldn't bring themselves to hang all that extra weight where the Pantera needs it the least. Some people were quite happy with them. Gary Hall had line-locks on all of his Super Panteras. I can remember being faced with the same dilemma, in fact, I bought a line-lock at one point. The idea of it bothered me so much that I returned it before I even had it out of the box! @davidnunn I suppose I should keep a more open mind as I embark on this journey with my first Pantera. With the exception of the Ford V8, it is unlike any car I have ever owned, so the natural tendency I have is to apply the more conventional knowledge I have of standard cars to the Pantera. However, the more I spend time with the car, the more I’m finding this approach may not always be suitable. Thanks for the history behind this aspect of the car. I’ll probably still eye this little lever with extreme suspicion and park the car in gear and block the wheels until I get the e-stop installed with a proper parking brake caliper, if only for the fact that the Pantera represents a substantial investment on my part in just buying it. Having it roll away or get damaged is a cringeworthy thought. The parking brake Scott sells is actually designed from scratch to be a parking brake. What a novel idea ! You’ll be happy. Airplanes use line lock parking brakes and they work great. As said, chances of a Total failure are slim.